The big plus for carpet tiles is that if one tile gets damaged, it can easily be replaced. Also, most carpet tiles are washable, so are ideal for use in a kitchen, bathroom or child’s room. As an added bonus they are easy to lay. Usually carpet tiles are squares of bonded needlefelt carpet but you can get carpet tiles made from a variety of materials, including coir (coconut matting). As with any other type of flooring, the first task is to measure up the room to work out how many tiles you need. Carpet tiles come in standard sizes – typically 400 mm (16 in) or 500 mm (20 in) square – so it is easy to work out how many you will need. Depending on the shape, size and layout of your room, decide whether you would prefer to start with whole tiles along the most visible walls (with a cut-down edge tile on the opposite side) or to centre the tiles with equal borders on both sides. Ideally, equal borders should not be less than a half tile in width, although if you do have thin borders you may be able to use all or part of the cut tiles elsewhere in the room. Allow 5 per cent or so extra for mistakes made in cutting and for future replacement, remembering that carpet tiles are usually sold in packs rather than individually. Carpet tiles can be laid on both solid and suspended timber floors, but because they are relatively thin, are better suited to a level surface. This means correcting any bias with floor levelling compound on a solid floor and at least a covering of hardboard on a timber floor. Deal with all faults in the sub-floor first. Assuming you have calculated the number of tiles needed and decided on equal borders, ‘snap’ chalk lines along the centre of the room in both directions. To do this, cover a string line with French chalk, fix it tightly at the centre of two facing walls at floor level and then pick it up and let it drop. You now have the starting point for the carpet tiles. Carpet tiles are laid ‘dry’ – that is, with no adhesive or tape. However, the first tile (in the centre of the room) should be laid on adhesive (or double-sided adhesive tape), so that it stays still during the subsequent laying process. If you are worried about other tiles moving, you could fit double-sided adhesive tape to, say, every third row across the middle of each tile. Working out from the centre tile, carpet tiles are normally laid so that adjacent tiles have the pile running in opposite directions -an arrow on the back of the tile indicates the direction of the pile. If there is no arrow, you can feel for the pile direction. To give the appearance of fitted carpet, tiles should be laid with their pile in the same direction. Many people lay carpet tiles of more than one colour for a more decorative effect. You should be able to push each tile up to fit flush against its neighbours, but you could use a knee-kicker to ensure a really snug fit. When all the whole tiles have been laid, cut some tiles to fit the gaps left at the edges. To cut a carpet tile, make two nicks on the edges with a trimming knife. Then turn the tile over and line up the nicks with a metal straight-edge and use this as a guide for your trimming knife. Where tiles have to be cut to fit around a pedestal basin or a WC in the bathroom, make a card template which fits exactly around the basin or WC and then transfer the shape to the tile and cut around it. You may find, however, that pedestal basins and WCs can be loosened sufficiently from the floor to tuck the carpet tile underneath, which will give a much better effect. 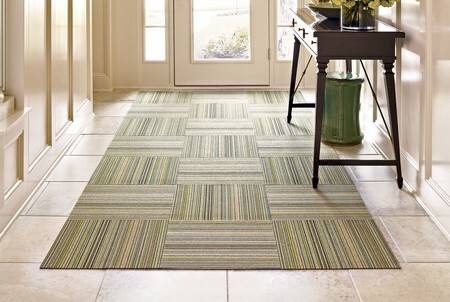 Cut carpet tiles to accommodate pipes passing up through the floor. At a doorway, use a profile gauge to transfer the shape of the door architrave on to the tile (remember to turn the gauge over as you are cutting the tile from the back) and cut through the tile with scissors. Fit a metal threshold strip to protect the edges and prevent the tiles from moving.